Sea Level Variations at Tropical Pacific Islands since 1950 – Becker et al. (2011) “The western tropical Pacific is usually considered as one of the most vulnerable region of the world under present-day and future global warming. It is often reported that some islands of the region already suffer significant sea level rise. To clarify the latter concern, in the present study we estimate sea level rise and variability since 1950 in the western tropical Pacific region (20°S-15°N; 120°E-135°W). We estimate the total rate of sea level change at selected individual islands, as a result of climate variability and change, plus vertical ground motion where available. For that purpose, we reconstruct a global sea level field from 1950 to 2009, combining long (over 1950–2009) good quality tide gauge records with 50-year-long (1958–2007) gridded sea surface heights from the Ocean General Circulation Model DRAKKAR. The results confirm that El Niño-Southern Oscillation (ENSO) events have a strong modulating effect on the interannual sea level variability of the western tropical Pacific, with lower/higher-than-average sea level during El Niño/La Niña events, of the order of ± 20–30 cm. Besides this sub-decadal ENSO signature, sea level of the studied region also shows low-frequency (multi decadal) variability which superimposes to, thus in some areas amplifies current global mean sea level rise due to ocean warming and land ice loss. We use GPS precise positioning records whenever possible to estimate the vertical ground motion component that is locally superimposed to the climate-related sea level components. Superposition of global mean sea level rise, low-frequency regional variability and vertical ground motion shows that some islands of the region suffered significant ‘total’ sea level rise (i.e., that felt by the population) during the past 60 years. This is especially the case for the Funafuti Island (Tuvalu) where the “total” rate of rise is found to be about 3 times larger than the global mean sea level rise over 1950–2009.” M. Becker, B. Meyssignac, C. Letetrel, W. Llovel, A. Cazenave, T. Delcroix, Global and Planetary Change, doi:10.1016/j.gloplacha.2011.09.004. Sea level projections to AD2500 with a new generation of climate change scenarios – Jevrejeva et al. (2011) “Sea level rise over the coming centuries is perhaps the most damaging side of rising temperature (Anthoff et al, 2009). The economic costs and social consequences of coastal flooding and forced migration will probably be one of the dominant impacts of global warming (Sugiyama et al, 2008). To date, however, few studies (Anthoff et al, 2009; Nicholls et al, 2008) on infrastructure and socio-economic planning include provision for multi-century and multi-meter rises in mean sea level. Here we use a physically plausible sea level model constrained by observations, and forced with four new Representative Concentration Pathways (RCP) radiative forcing scenarios (Moss et al, 2010) to project median sea level rises of 0.57 for the lowest forcing and 1.10 m for the highest forcing by 2100 which rise to 1.84 and 5.49 m respectively by 2500. Sea level will continue to rise for several centuries even after stabilization of radiative forcing with most of the rise after 2100 due to the long response time of sea level. The rate of sea level rise would be positive for centuries, requiring 200–400 years to drop to the 1.8 mm/yr 20th century average, except for the RCP3PD which would rely on geoengineering.” S. Jevrejeva, J.C. Moore, A. Grinsted, Global and Planetary Change, doi:10.1016/j.gloplacha.2011.09.006. The fate of European breeding birds under climate, land-use and dispersal scenarios – Barbet-Massin et al. (2011) “Many species have already shifted their distributions in response to recent climate change. Here, we aimed at predicting the future breeding distributions of European birds under climate, land-use and dispersal scenarios. We predicted current and future distributions of 409 species within an ensemble forecast framework using seven species distribution models (SDMs), five climate scenarios and three emission and land-use scenarios. We then compared results from SDMs using climate-only variables, habitat-only variables or both climate and habitat variables. In order to account for a species’ dispersal abilities, we used natal dispersal estimates and developed a probabilistic method that produced a dispersal scenario intermediate between the null and full dispersal scenarios generally considered in such studies. We then compared results from all scenarios in terms of future predicted range changes, range shifts and variations in species richness. Modeling accuracy was better with climate-only variables than with habitat-only variables, and better with both climate and habitat variables. Habitat models predicted smaller range shifts and smaller variations in range size and species richness than climate models. Using both climate and habitat variables, it was predicted that the range of 71% of the species would decrease by 2050, with a 335km median shift. Predicted variations in species richness showed large decreases in the southern regions of Europe, as well as increases, mainly in Scandinavia and northern Russia. The partial dispersal scenario was significantly different from the full dispersal scenario for 25% of the species, resulting in the local reduction of the future predicted species richness of up to 10%. We concluded that the breeding range of most European birds will decrease in spite of dispersal abilities close to a full dispersal hypothesis, and that given the contrasted predictions obtained when modeling climate change only and land-use change only, both scenarios must be taken into consideration.” Morgane Barbet-Massin, Wilfried Thuiller, Frédéric Jiguet, Global Change Biology, DOI: 10.1111/j.1365-2486.2011.02552.x. Greenland ice sheet surface melt extent and trends: 1960-2010 – Mernild et al. (2011) “Observed meteorological data and a high-resolution (5 km) model were used to simulate Greenland ice sheet surface melt extent and trends before the satellite era (1960-79) and during the satellite era through 2010°. 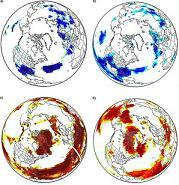 The model output was compared with passive microwave satellite observations of melt extent. 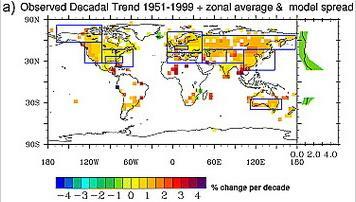 For 1960-2010 the average simulated melt extent was 15 ± 5%. 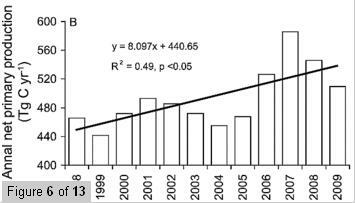 For the period 1960-72, simulated melt extent decreased by an average of 6%, whereas 1973-2010 had an average increase of 13%, with record melt extent in 2010. The trend in simulated melt extent since 1972 indicated that the melt extent in 2010 averaged twice that in the early 1970s. The maximum and mean melt extents for 2010 were 52% (∼9.5 × 105 km2) and 28% (∼5.2 × 105 km2), respectively, due to higher-than-average winter and summer temperatures and lower-than-average winter precipitation. For 2010, the southwest Greenland melt duration was 41-60 days longer than the 1960-2010 average, while the northeast Greenland melt duration was up to 20 days shorter. From 1960 to 1972 the melting period (with a >10% melt extent) decreased by an average of 3 days a−1. After 1972, the period increased by an average of 2 days a−1, indicating an extended melting period for the ice sheet of about 70 days: 40 and 30 days in spring and autumn, respectively.” Mernild, Sebastian H.; Mote, Thomas L.; Liston, Glen E., Journal of Glaciology, Volume 57, Number 204, September 2011 , pp. 621-628(8), DOI: 10.3189/002214311797409712. The contribution of anthropogenic forcings to regional changes in temperature during the last decade – Christidis et al. (2011) “Regional distributions of the mean annual temperature in the 2000s are computed with and without the effect of anthropogenic influences on the climate in several sub-continental regions. Simulated global patterns of the temperature response to external forcings are regressed against observations using optimal fingerprinting. The global analysis provides constraints which are then used to construct the regional temperature distributions. A similar approach was also employed in previous work, but here the methodology is extended to examine changes in any region, including areas with a poor observational coverage that were omitted in the earlier study. Two different General Circulation Models (GCMs) are used in the analysis. Anthropogenic forcings are found to have at least quadrupled the likelihood of occurrence of a year warmer than the warmest year since 1900 in 23 out of the 24 regions. The temperature distributions computed with the two models are very similar. While a more detailed assessment of model dependencies remains to be made once additional suitable GCM simulations become available, the present study introduces the statistical methodology and demonstrates its first application. The derived information concerning the effect of human influences on the regional climate is useful for adaptation planning. Moreover, by pre-computing the change in the likelihood of exceeding a temperature threshold over a range of thresholds, this kind of analysis enables a near real-time assessment of the anthropogenic impact on the observed regional temperatures.” Nikolaos Christidis, Peter A. Stott, Francis W. Zwiers, Hideo Shiogama and Toru Nozawa, Climate Dynamics, DOI: 10.1007/s00382-011-1184-0. Urbanization effect on the diurnal temperature range: different roles under solar dimming and brightening – Wang et al. (2011) “Based on the 1960~2009 meteorological data from 559 stations over China, the urbanization effect on the diurnal temperature range (DTR) was evaluated in this study. 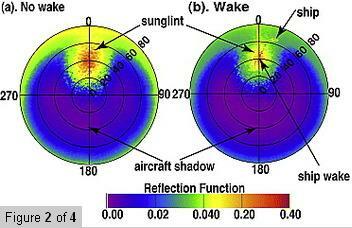 Different roles of urbanization were specially detected under solar dimming and solar brightening. 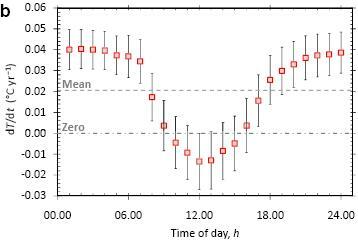 During the solar dimming time, both urban and rural stations showed decreasing trends in maximum temperature(Tmax) due to decreased radiation, suggesting that dimming effects are not only evident in urbanized areas, but also in rural areas. Minimum temperature (Tmin), however, increased more substantially in urban areas than in rural areas over the dimming period, resulting in greater decrease in DTR in the urban areas. When the radiation reversed from dimming to brightening, the change in the DTR became different. The Tmax increased faster in rural areas, suggesting that the brightening could be much stronger in rural areas than it in urban areas. Similar trends of Tmin between urban and rural appeared during the brightening period. Urban DTR continued to show a decreasing trend due to the urbanization effect while the rural DTR presented an increasing trend. The remarkable DTR difference in the urban and rural areas showed a significant urbanization effect in the solar brightening time.” Kai Wang, Hong Ye, Feng Chen, Yongzhu Xiong and Cuiping Wang, Journal of Climate 2011, doi: 10.1175/JCLI-D-10-05030.1. Relationship of Lower Troposphere Cloud Cover and Cosmic Rays: An Updated Perspective – Agee et al. (2011) “An updated assessment has been made of the proposed hypothesis that “galactic cosmic rays (GCRs) are positively correlated with lower troposphere global cloudiness.” A brief review of the many conflicting studies that attempt to prove or disprove this hypothesis is also presented. It has been determined in this assessment that the recent extended quiet period (QP) between solar cycles 23–24 has led to a record high level of GCRs, which in turn has been accompanied by a record low level of lower troposphere global cloudiness. 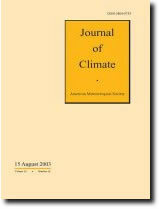 This represents a possible observational disconnect, and the update presented here continues to support the need for further research on the GCR-Cloud hypothesis and its possible role in the science of climate change.” Ernest M. Agee, Kandace Kiefer and Emily Cornett, Journal of Climate 2011, doi: 10.1175/JCLI-D-11-00169.1. Who likes it hot? A global analysis of the climatic, ecological, and evolutionary determinants of warming tolerance in ants – Diamond et al. (2011) “Effects of climate warming on wild populations of organisms are expected to be greatest at higher latitudes, paralleling greater anticipated increases in temperature in these regions. Yet, these expectations assume that populations in different regions and taxa are equally susceptible to the effects of warming. This is unlikely to be the case. Here, we develop a series of predictive models for physiological thermal tolerances in ants based on current and future climates. We found that tropical ants have lower warming tolerances, a metric of susceptibility to climate warming, than temperate ants despite greater increases in temperature at higher latitudes. Using climatic, ecological and phylogenetic data, we refine our predictions of which ants (across all regions) were most susceptible to climate warming. We found that ants occupying warmer and more mesic forested habitats at lower elevations are the most physiologically susceptible to deleterious effects of climate warming. Phylogenetic history was also a strong indicator of physiological susceptibility. In short, we find that ants that live in the canopies of hot, tropical forest are the most at risk, globally, from climate warming. Unfortunately this is where many, perhaps most, ant and other species on Earth live.” Sarah E. Diamond, D. Magdalena Sorger, Jiri Hulcr, Shannon L. Pelini, Israel Del Toro, Christopher Hirsch, Erik Oberg, Robert R. Dunn, Global Change Biology, DOI: 10.1111/j.1365-2486.2011.02542.x. Climate change, the monsoon, and rice yield in India – Auffhammer et al. (2011) “Recent research indicates that monsoon rainfall became less frequent but more intense in India during the latter half of the Twentieth Century, thus increasing the risk of drought and flood damage to the country’s wet-season (kharif) rice crop. Our statistical analysis of state-level Indian data confirms that drought and extreme rainfall negatively affected rice yield (harvest per hectare) in predominantly rainfed areas during 1966–2002, with drought having a much greater impact than extreme rainfall. Using Monte Carlo simulation, we find that yield would have been 1.7% higher on average if monsoon characteristics, especially drought frequency, had not changed since 1960. Yield would have received an additional boost of nearly 4% if two other meteorological changes (warmer nights and lower rainfall at the end of the growing season) had not occurred. In combination, these changes would have increased cumulative harvest during 1966–2002 by an amount equivalent to about a fifth of the increase caused by improvements in farming technology. Climate change has evidently already negatively affected India’s hundreds of millions of rice producers and consumers.” Maximilian Auffhammer, V. Ramanathan and Jeffrey R. Vincent, Climatic Change, DOI: 10.1007/s10584-011-0208-4. Intensification of seasonal extremes given a 2°C global warming target – Anderson (2011) “Current international efforts to reduce greenhouse gas emissions and limit human-induced global-mean near-surface temperature increases to 2°C, relative to the pre-industrial era, are intended to avoid possibly significant and dangerous impacts to physical, biological, and socio-economic systems. However, it is unknown how these various systems will respond to such a temperature increase because their relevant spatial scales are much different than those represented by numerical global climate models—the standard tool for climate change studies. This deficiency can be addressed by using higher-resolution regional climate models, but at great computational expense. The research presented here seeks to determine how a 2°C global-mean temperature increase might change the frequency of seasonal temperature extremes, both in the United States and around the globe, without necessarily resorting to these computationally-intensive model experiments. 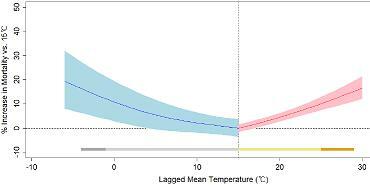 Results indicate that in many locations the regional temperature increases that accompany a 2°C increase in global mean temperatures are significantly larger than the interannual-to-decadal variations in seasonal-mean temperatures; in these locations a 2°C global mean temperature increase results in seasonal-mean temperatures that consistently exceed the most extreme values experienced during the second half of the 20th Century. Further, results indicate that many tropical regions, despite having relatively modest overall temperature increases, will have the most substantial increase in number of hot extremes. These results highlight that extremes very well could become the norm, even given the 2°C temperature increase target.” Bruce T. Anderson, Climatic Change, DOI: 10.1007/s10584-011-0213-7. Extreme events, trends, and variability in Northern Hemisphere lake-ice phenology (1855–2005) – Benson et al. (2011) “Often extreme events, more than changes in mean conditions, have the greatest impact on the environment and human well-being. Here we examine changes in the occurrence of extremes in the timing of the annual formation and disappearance of lake ice in the Northern Hemisphere. Both changes in the mean condition and in variability around the mean condition can alter the probability of extreme events. Using long-term ice phenology data covering two periods 1855–6 to 2004–5 and 1905–6 to 2004–5 for a total of 75 lakes, we examined patterns in long-term trends and variability in the context of understanding the occurrence of extreme events. We also examined patterns in trends for a 30-year subset (1975–6 to 2004–5) of the 100-year data set. Trends for ice variables in the recent 30-year period were steeper than those in the 100- and 150-year periods, and trends in the 150-year period were steeper than in the 100-year period. Ranges of rates of change (days per decade) among time periods based on linear regression were 0.3−1.6 later for freeze, 0.5−1.9 earlier for breakup, and 0.7−4.3 shorter for duration. Mostly, standard deviation did not change, or it decreased in the 150-year and 100-year periods. During the recent 50-year period, standard deviation calculated in 10-year windows increased for all ice measures. For the 150-year and 100-year periods changes in the mean ice dates rather than changes in variability most strongly influenced the significant increases in the frequency of extreme lake ice events associated with warmer conditions and decreases in the frequency of extreme events associated with cooler conditions.” Barbara J. Benson, John J. Magnuson, Olaf P. Jensen, Virginia M. Card, Glenn Hodgkins, Johanna Korhonen, David M. Livingstone, Kenton M. Stewart, Gesa A. Weyhenmeyer and Nick G. Granin, Climatic Change, DOI: 10.1007/s10584-011-0212-8. This is a list of papers on Northern Hemisphere winters 2009-2010 and 2010-2011 which were very cold and snowy at some places. The list is not complete, and will most likely be updated in the future in order to make it more thorough and more representative. UPDATE (October 25, 2011): Taws et al. (2011) added. 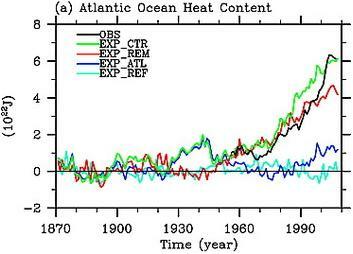 Re-emerging ocean temperature anomalies in late-2010 associated with a repeat negative NAO – Taws et al. (2011) “Northern Europe was influenced by consecutive episodes of extreme winter weather at the start and end of the 2010 calendar year. A tripole pattern in North Atlantic sea surface temperature anomalies (SSTAs), associated with an exceptionally negative phase of the North Atlantic Oscillation (NAO), characterized both winter periods. This pattern was largely absent at the surface during the 2010 summer season; however equivalent sub-surface temperature anomalies were preserved within the seasonal thermocline throughout the year. Here, we present evidence for the re-emergence of late-winter 2009/10 SSTAs during the following early winter season of 2010/11. The observed re-emergence contributes toward the winter-to-winter persistence of the anomalous tripole pattern. Considering the active influence of the oceans upon leading modes of atmospheric circulation over seasonal timescales, associated with the memory of large-scale sea surface temperature anomaly patterns, the re-emergence of remnant temperature anomalies may have also contributed toward the persistence of a negative winter NAO, and the recurrence of extreme wintry conditions over the initial 2010/11 winter season.” Taws, S. L., R. Marsh, N. C. Wells, and J. Hirschi (2011), Geophys. Res. Lett., 38, L20601, doi:10.1029/2011GL048978. Recent warm and cold daily winter temperature extremes in the Northern Hemisphere – Guirguis et al. (2011) “The winters of 2009–2010 and 2010–2011 brought frigid temperatures to parts of Europe, Russia, and the U.S. We analyzed regional and Northern Hemispheric (NH) daily temperature extremes for these two consecutive winters in the historical context of the past 63 years. While some parts clearly experienced very cold temperatures, the NH was not anomalously cold. Extreme warm events were much more prevalent in both magnitude and spatial extent. Importantly, the persistent negative state of the North Atlantic Oscillation (NAO) explained the bulk of the observed cold anomalies, however the warm extremes were anomalous even accounting for the NAO and also considering the states of the Pacific Decadal Oscillation (PDO) and El Niño Southern Oscillation (ENSO). These winters’ widespread and intense warm extremes together with a continuing hemispheric decline in cold snap activity was a pattern fully consistent with a continuation of the warming trend observed in recent decades.” Guirguis, K., A. Gershunov, R. Schwartz, and S. Bennett (2011), Geophys. Res. Lett., 38, L17701, doi:10.1029/2011GL048762. Anomalous climatic conditions associated with the El Niño Modoki during boreal winter of 2009 – Ratnam et al. (2011) “The winter months from December 2009 to February 2010 witnessed extreme conditions affecting lives of millions of people around the globe. During this winter, the El Niño Modoki in the tropical Pacific was a dominant climatic mode. In this study, exclusive impacts of the El Niño Modoki are evaluated with an Atmospheric General Circulation Model. Sensitivity experiments are conducted by selectively specifying anomalies of the observed sea surface temperature in the tropical Pacific. Observed data are also used in the diagnostics to trace the source of forced Rossby waves. Both the observational results and the model simulated results show that the heating associated with the El Niño Modoki in the central tropical Pacific accounted for most of the anomalous conditions observed over southern parts of North America, Europe and over most countries in the Southern Hemisphere viz. Uruguay. Unlike those, the model-simulated results suggest that the anomalously high precipitation observed over Australia and Florida might be associated with the narrow eastern Pacific heating observed during the season.” J. V. Ratnam, S. K. Behera, Y. Masumoto, K. Takahashi and T. Yamagata, Climate Dynamics, DOI: 10.1007/s00382-011-1108-z. Origin and predictability of the extreme negative NAO winter of 2009/10 – Jung et al. (2011) “The winter of 2009/2010 was one of the most negative winters of the North Atlantic Oscillation (NAO) during the last 150 years. While most operational extended-range forecasting systems had difficulties in predicting the onset of the negative NAO phase, once established, extended-range forecasts were relatively skilful in predicting its persistence. Here, the origin and predictability of the unusual winter of 2009/10 are explored through numerical experimentation with the ECMWF Monthly forecasting system. More specifically, the role of anomalies in sea surface temperature (SST) and sea ice, the tropical atmospheric circulation, the stratospheric polar vortex, solar insolation and near surface temperature (proxy for snow cover) are examined. None of these anomalies is capable of producing the observed NAO anomaly, especially in terms of its magnitude. The results of this study support the hypothesis that internal atmospheric dynamical processes were responsible for the onset and persistence of the negative NAO phase during the 2009/10 winter.” Jung, T., F. Vitart, L. Ferranti, and J.-J. Morcrette (2011), Geophys. Res. Lett., 38, L07701, doi:10.1029/2011GL046786. Influences of Arctic Oscillation and Madden-Julian Oscillation on cold surges and heavy snowfalls over Korea: A case study for the winter of 2009–2010 – Park et al. (2010) “In the winter of 2009–2010, frequent and long-lasting cold weather affected Korea. Four major cold surges and several heavy snowfall events were observed, including a record-breaking event on 4 January 2010. These four cold surges had distinct properties with regard to their relationships to the phases of the Arctic Oscillation (AO) and the Madden-Julian Oscillation (MJO), suggesting the possible influences of the AO and MJO on the cold surges and heavy snowfalls. The four cold surges were of two distinct types: the wave train type and the blocking type, which were differentiated by their mechanisms. With regard to the relationships of the cold surges to the AO, three cold surges occurred during a strongly negative AO period, which lasted for more than 1 month. The Siberian High expanded from the Arctic high-pressure region to East Asia during the negative AO period. A cold surge occurred during a positive AO, with the expansion of the Siberian High across the Eurasian continent. An MJO-induced circulation, corresponding to strong tropical convection over the tropical Indian Ocean, seems to have reinforced the cold surges over East Asia. In addition, the active local Hadley circulation modulated by a convection center over the Indian Ocean tends to enhance midlatitude synoptic disturbances across East Asia and provides favorable conditions for upward motion over the region. In short, the effects of the AO and MJO, along with the existing low-level moisture supply, contributed to heavy snowfalls associated with strong cold surges over Korea during the winter of 2009–2010.” Park, T.-W., C.-H. Ho, S. Yang, and J.-H. Jeong (2010), J. Geophys. Res., 115, D23122, doi:10.1029/2010JD014794. Revisiting the Earth’s sea-level and energy budgets from 1961 to 2008 – Church et al. (2011) “We review the sea-level and energy budgets together from 1961, using recent and updated estimates of all terms. From 1972 to 2008, the observed sea-level rise (1.8 ± 0.2 mm yr−1 from tide gauges alone and 2.1 ± 0.2 mm yr−1 from a combination of tide gauges and altimeter observations) agrees well with the sum of contributions (1.8 ± 0.4 mm yr−1) in magnitude and with both having similar increases in the rate of rise during the period. The largest contributions come from ocean thermal expansion (0.8 mm yr−1) and the melting of glaciers and ice caps (0.7 mm yr−1), with Greenland and Antarctica contributing about 0.4 mm yr−1. The cryospheric contributions increase through the period (particularly in the 1990s) but the thermosteric contribution increases less rapidly. We include an improved estimate of aquifer depletion (0.3 mm yr−1), partially offsetting the retention of water in dams and giving a total terrestrial storage contribution of −0.1 mm yr−1. Ocean warming (90% of the total of the Earth’s energy increase) continues through to the end of the record, in agreement with continued greenhouse gas forcing. The aerosol forcing, inferred as a residual in the atmospheric energy balance, is estimated as −0.8 ± 0.4 W m−2 for the 1980s and early 1990s. It increases in the late 1990s, as is required for consistency with little surface warming over the last decade. This increase is likely at least partially related to substantial increases in aerosol emissions from developing nations and moderate volcanic activity.” Church, J. A., N. J. White, L. F. Konikow, C. M. Domingues, J. G. Cogley, E. Rignot, J. M. Gregory, M. R. van den Broeke, A. J. Monaghan, and I. Velicogna (2011), Geophys. Res. Lett., 38, L18601, doi:10.1029/2011GL048794. Contribution of Oceanic Gas Hydrate Dissociation to the Formation of Arctic Ocean Methane Plumes – Reagan et al. (2011) “Vast quantities of methane are trapped in oceanic hydrate deposits, and there is concern that a rise in the ocean temperature will induce dissociation of these hydrate accumulations, potentially releasing large amounts of carbon into the atmosphere. Because methane is a powerful greenhouse gas, such a release could have dramatic climatic consequences. The recent discovery of active methane gas venting along the landward limit of the gas hydrate stability zone (GHSZ) on the shallow continental slope (150 m – 400 m) west of Svalbard suggests that this process may already have begun, but the source of the methane has not yet been determined. This study performs 2-D simulations of hydrate dissociation in conditions representative of the Arctic Ocean margin to assess whether such hydrates could contribute to the observed gas release. The results show that shallow, low-saturation hydrate deposits, if subjected to recently observed or future predicted temperature changes at the seafloor, can release quantities of methane at the magnitudes similar to what has been observed, and that the releases will be localized near the landward limit of the GHSZ. Both gradual and rapid warming is simulated, along with a parametric sensitivity analysis, and localized gas release is observed for most of the cases. These results resemble the recently published observations and strongly suggest that hydrate dissociation and methane release as a result of climate change may be a real phenomenon, that it could occur on decadal timescales, and that it already may be occurring.” Reagan, M. T., G. J. Moridis, S. Elliott, and M. E. Maltrud (2011), J. Geophys. Res., doi:10.1029/2011JC007189, in press. Will there be a significant change to El Niño in the 21st century? – Stevenson et al. (2011) “The El Niño/Southern Oscillation (ENSO) response to anthropogenic climate change is assessed in the following 1° nominal resolution CCSM4 CMIP5 simulations: 20th century ensemble, pre-industrial control, 21st century projections and stabilized 2100–2300 ‘extension runs’. 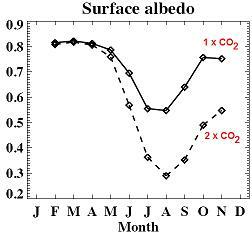 ENSO variability weakens slightly with CO2; however, various significance tests reveal that changes are insignificant at all but the highest CO2 levels. Comparison with the 1850 control simulation suggests that ENSO changes may become significant on centennial timescales; the lack of signal in the 20th vs. 21st century ensembles is due to their limited duration. Changes to the mean state are consistent with previous studies: a weakening of the subtropical wind stress curl, an eastward shift of the tropical convective cells, a reduction in the zonal SST gradient and an increase in vertical thermal stratification take place as CO2 increases. The extratropical thermocline deepens throughout the 21st century, with the tropical thermocline changing slowly in response. The adjustment timescale is set by the relevant ocean dynamics, and the delay in its effect on ENSO variability is not diminished by increasing ensemble size. The CCSM4 results imply that 21st century simulations may simply be too short for identification of significant tropical variability response to climate change. An examination of atmospheric teleconnections, in contrast, shows that the remote influences of ENSO do respond rapidly to climate change in some regions, particularly during boreal winter. This suggests that changes to ENSO impacts may take place well before changes to oceanic tropical variability itself becomes significant.” Samantha Stevenson and Baylor Fox-Kemper, Markus Jochum, Richard Neale, Clara Deser and Gerald Meehl, Journal of Climate 2011, doi: 10.1175/JCLI-D-11-00252.1. Changes in the extra-tropical storm tracks in response to changes in SST in an AGCM – Graff & Lacasce (2011) “A poleward shift in the extra-tropical storm tracks has been indentified in observational and climate simulations. We examine the role of altered sea surface temperatures (SSTs) on the storm track position and intensity in an atmospheric general circulation model (AGCM) using realistic lower boundary conditions. A set of experiments were conducted in which the SSTs where changed by 2K in specified latitude bands. The primary profile was inspired by the observed trend in ocean temperatures, with the largest warming occurring at low-latitudes. The response to several other heating patterns was also investigated, to examine the effect of imposed gradients and low-vs. high-latitude heating. We focus on the Northern Hemisphere (NH) winter, averaged over a 20 year period. Results show that the storm tracks respond to changes in both the mean SST and SST gradients, consistent with previous studies employing aquaplanet (water-only) boundary conditions. Increasing the mean SST strengthens the Hadley circulation and the sub-tropical jets, causing the storm tracks to intensify and shift poleward. Increasing the SST gradient at mid-latitudes similarly causes an intensification and a poleward shift of the storm tracks. Increasing the gradient in the tropics on the other hand causes the Hadley cells to contract and the storm tracks to shift equatorward. Consistent shifts are seen in the mean zonal velocity, the atmospheric baroclinicity, the eddy heat and momentum fluxes, and the atmospheric meridional overturning circulation. The results support the idea that oceanic heating could be a contributing factor to the observed shift in the storm tracks.” Lise Seland Graff and J. H. Lacasce, Journal of Climate 2011, doi: 10.1175/JCLI-D-11-00174.1. Secular trends in Arctic Ocean net primary production – Arrigo & van Dijken (2011) “A satellite-based study was conducted to document daily changes in net primary production (NPP) by phytoplankton in the Arctic Ocean from 1998 to 2009 using fields of sea ice extent, sea surface temperature, and chlorophyll a concentrations. Total annual NPP over the Arctic Ocean exhibited a statistically significant 20% increase between 1998 and 2009 (range = 441–585 Tg C yr−1), due mainly to secular increases in both the extent of open water (+27%) and the duration of the open water season (+45 days). Increases in NPP over the 12 year study period were largest in the eastern Arctic Ocean, most notably in the Kara (+70%) and Siberian (+135%) sectors. NPP per unit area for the Arctic Ocean averaged 101 g C m−2 yr−1 with no significant change over the study period. In the western sectors, NPP ranged from 71.3 ± 11.0 g C m−2 yr−1 in the Beaufort to 96.9 ± 7.4 g C m−2 yr−1 in the Chukchi, while in the more productive eastern Arctic, annual NPP between 1998 and 2009 ranged from 101 ± 15.8 in the Siberian sector to 121 ± 20.2 in the Laptev. Results of a statistical analysis suggest that between 1979 and 1998 (prior to the launch of SeaWiFS and MODIS), total Arctic NPP likely averaged 438 ± 21.5 Tg C yr−1. Moreover, when summer minimum ice cover drops to zero sometime during the first half of this century, annual NPP in the Arctic Ocean could reach ∼730 Tg C yr−1. Nutrient fluxes into Arctic surface waters need to be better understood to determine if these projected increases are sustainable.” Arrigo, K. R., and G. L. van Dijken (2011), J. Geophys. Res., 116, C09011, doi:10.1029/2011JC007151. 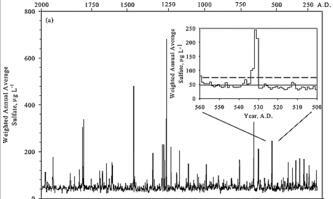 New ice core record shows prominent volcanic eruption in 531 A.D.
South Pole ice core record of explosive volcanic eruptions in the first and second millennia A.D. and evidence of a large eruption in the tropics around 535 A.D. – Ferris et al. (2011) “A record of explosive eruptions over the last 1830 years reconstructed from a South Pole, Antarctica, ice core extends the coverage of volcanic history to the start of the first millennium A.D. The ice core dating by annual layer counting carries an uncertainty of ±2% of the number of years from time markers, with the largest dating error of ±20 years at the bottom of the 182 m core. Several aspects of the methodology of detecting and quantifying volcanic sulfate signals in ice cores are examined in developing this record. The new record is remarkably consistent with previous South Pole records. A comparison with records from several Antarctica locations suggests that the South Pole location is among the best for ice core reconstruction of volcanic records, owing to the excellent preservation of volcanic signals at the South Pole, the relatively low and uniform sulfate background, and the moderately high snow accumulation rates which allow for dating by annual layer counting. A prominent volcanic event dated at 531(±15) A.D., along with evidence from other records, indicates that an unusually large eruption took place in the tropics and was probably responsible for the “mystery cloud” climate episode of 536–537 A.D. The date of 536 is suggested for a prominent volcanic signal that appears in the first half of the sixth century A.D. in ice cores, which can in turn be used as a time stratigraphic marker in dating ice cores by annual layer counting or by computing average accumulation rates or layer thicknesses with such markers.” Ferris, D. G., J. Cole-Dai, A. R. Reyes, and D. M. Budner (2011), J. Geophys. Res., 116, D17308, doi:10.1029/2011JD015916. Those interested in glaciers, be sure to check out the index of glacier posts in Mauri Pelto’s blog “From a Glaciers Perspective”. Temporal and spatial variability of Great Lakes ice cover, 1973–2010 – Wang et al. (2011) “In this study, temporal and spatial variability of ice cover in the Great Lakes are investigated using historical satellite measurements from 1973 to 2010. The seasonal cycle of ice cover was constructed for all the lakes including Lake St. Clair. A unique feature found in the seasonal cycle is that the standard deviations (i.e., variability) of ice cover are larger than the climatological means for each lake. This indicates that Great Lakes ice cover experiences large variability in response to predominant natural climate forcing and has poor predictability. Spectral analysis shows that lake ice has both quasi-decadal and interannual periodicities of ~8 years and ~4 years. There was a significant downward trend in ice coverage from 1973 to the present for all the lakes, with Lake Ontario having the largest, and Lakes Erie and St. Clair having the smallest. The translated total loss in lake ice over the entire 38-year record varies from 37% in Lake St. Clair (least) to 88% in Lake Ontario (most). The total loss for overall Great Lakes ice coverage is 71%, while Lake Superior places second with a 79% loss. An EOF (empirical orthogonal function) analysis indicates that a major response of ice cover to atmospheric forcing is in phase in all six lakes, accounting for 80.8% of the total variance. The second mode shows an out-of-phase spatial variability between the upper lakes and lower lakes, accounting for 10.7% of the total variance. The regression of the first EOF-mode time series to sea level pressure, surface air temperature, and surface wind shows that lake ice mainly responds to the combined AO (Arctic Oscillation) and ENSO (El Nino and Southern Oscillation) patterns.” Jia Wang, Xuezhi Bai, Haohuo Hu, Anne Clites, Marie Colton, and Brent Lofgren, Journal of Climate 2011, doi: 10.1175/2011JCLI4066.1. 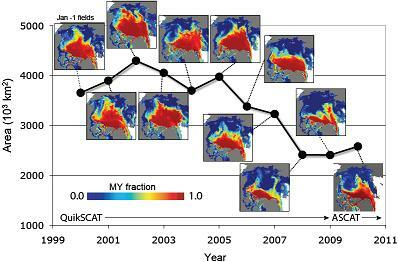 Sea ice loss enhances wave action at the Arctic coast – Overeem et al. (2011) “Erosion rates of permafrost coasts along the Beaufort Sea accelerated over the past 50 years synchronously with Arctic-wide declines in sea ice extent, suggesting a causal relationship between the two. 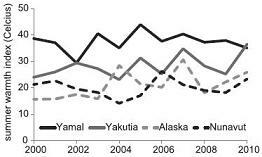 A fetch-limited wave model driven by sea ice position and local wind data from northern Alaska indicates that the exposure of permafrost bluffs to seawater increased by a factor of 2.5 during 1979–2009. The duration of the open water season expanded from ∼45 days to ∼95 days. Open water expanded more rapidly toward the fall (∼0.92 day yr−1), when sea surface temperatures are cooler, than into the mid-summer (∼0.71 days yr−1).Time-lapse imagery demonstrates the relatively efficient erosive action of a single storm in August. Sea surface temperatures have already decreased significantly by fall, reducing the potential impact of thermal erosion due to fall season storm waves.” Overeem, I., R. S. Anderson, C. W. Wobus, G. D. Clow, F. E. Urban, and N. Matell (2011), Geophys. Res. Lett., 38, L17503, doi:10.1029/2011GL048681. 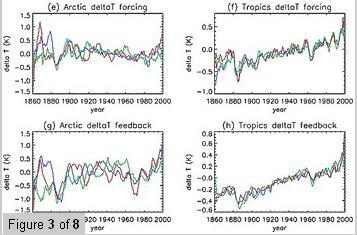 How well models reproduce 20th century temperature? A balance between radiative forcing and climate feedback in the modeled 20th century temperature response – Crook & Forster (2011) “In this paper, we breakdown the temperature response of coupled ocean-atmosphere climate models into components due to radiative forcing, climate feedback, and heat storage and transport to understand how well climate models reproduce the observed 20th century temperature record. Despite large differences between models’ feedback strength, they generally reproduce the temperature response well but for different reasons in each model. We show that the differences in forcing and heat storage and transport give rise to a considerable part of the intermodel variability in global, Arctic, and tropical mean temperature responses over the 20th century. Projected future warming trends are much more dependent on a model’s feedback strength, suggesting that constraining future climate change by weighting these models on the basis of their 20th century reproductive skill is not possible. We find that tropical 20th century warming is too large and Arctic amplification is unrealistically low in the Geophysical Fluid Dynamics Laboratory CM2.1, Meteorological Research Institute CGCM232a, and MIROC3.2(hires) models because of unrealistic forcing distributions. The Arctic amplification in both National Center for Atmospheric Research models is unrealistically high because of high feedback contributions in the Arctic compared to the tropics. Few models reproduce the strong observed warming trend from 1918 to 1940. The simulated trend is too low, particularly in the tropics, even allowing for internal variability, suggesting there is too little positive forcing or too much negative forcing in the models at this time. Over the whole of the 20th century, the feedback strength is likely to be underestimated by the multimodel mean.” Crook, J. A., and P. M. Forster (2011), J. Geophys. Res., 116, D17108, doi:10.1029/2011JD015924. 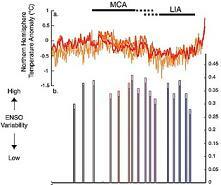 Detectable regional changes in the number of warm nights – Morak et al. 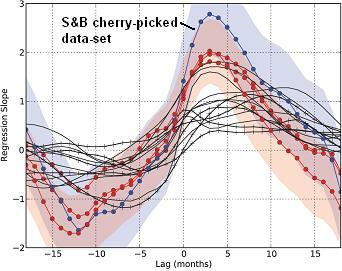 (2011) “In this study we analyse gridded observed and multi-model simulated trends in the annual number of warm nights during the second half of the 20th century. We show that there is evidence that external forcing has significantly increased the number of warm nights, both globally and over many regions. We define thirteen regions with a high density of observational data over two datasets, for which we compare observed and simulated trends from 20th century simulations. The main analysis period is 1951–1999, with a sub-period of 1970–1999. In order to investigate if observed trends changed past 1999, we also analysed periods of 1955–2003 and 1974–2003. Both observed and ensemble mean model data from all models analysed show a positive trend for the regional mean number of warm nights in all regions within this 49 year period (1951–1999). The trends tend to become more pronounced over the sub-period 1970–1999 and even more so up to 2003. We apply a fingerprint analysis to assess if trends are detectable relative to internal climate variability. We find that changes in the global scale analysis, and in 9 out of 13 regions, are detectable at the 5% significance level. A large part of the observed global-scale trend in TN90 results from the trend in mean temperature, which has been attributed largely to anthropogenic greenhouse gas increase. This suggests that the detected global-scale trends in the number of warm nights are at least partly anthropogenic.” Morak, S., G. C. Hegerl, and J. Kenyon (2011), Geophys. Res. Lett., 38, L17703, doi:10.1029/2011GL048531. Cloud variations and the Earth’s energy budget – Dessler (2011) “The question of whether clouds are the cause of surface temperature changes, rather than acting as a feedback in response to those temperature changes, is explored using data obtained between 2000 and 2010. An energy budget calculation shows that the energy trapped by clouds accounts for little of the observed climate variations. And observations of the lagged response of top-of-atmosphere (TOA) energy fluxes to surface temperature variations are not evidence that clouds are causing climate change.” Dessler, A. E. (2011), Geophys. Res. Lett., doi:10.1029/2011GL049236. Population Vulnerability to Climate Change Linked to Timing of Breeding in Boreal Ducks – Drever et al. (2011) “Identifying and understanding why traits make species vulnerable to changing climatic conditions remain central problems in evolutionary and applied ecology. We used spring snow cover duration as a proxy for phenological timing of wetland ecosystems, and examined how snow cover duration during spring and during the entire snow season affected population dynamics of duck species breeding in the western boreal forest of North America, 1973-2007. We predicted that population-level responses would differ among duck species, such that late-nesting species with reduced flexibility in their timing of breeding, i.e. scaup (Aythya spp.) and scoter (Melanitta spp. ), would be more strongly affected by changing snow cover conditions relative to species better able to adjust timing of breeding to seasonal phenology, i.e. mallard (Anas platyrhynchos) and American wigeon (Anas americana). Population growth rates of scaup and scoter were positively linked to spring snow cover duration; after accounting for effects of density dependence, larger breeding season populations resulted after springs with longer snow cover duration than after springs with shorter snow cover duration. In contrast, population growth rates of mallard and wigeon were either negatively or only weakly associated with snow cover duration. Duck population models were then incorporated with snow cover duration derived from climate model simulations under the A2 emission scenario, and these predictions suggested that late-nesting duck species will experience the most severe population declines. Results are consistent with a hypothesis that the gradual climatic warming observed in the western boreal forest of North America has contributed to and may continue to exacerbate population declines of scaup and scoter.” Mark C. Drever, Robert G. Clark, Chris Derksen, Stuart M. Slattery, Peter Toose, Thomas D. Nudds, Global Change Biology, DOI: 10.1111/j.1365-2486.2011.02541.x. Here is the new research published last week. I’m not including everything that was published but just some papers that got my attention. Those who follow my Facebook page (and/or Twitter) have already seen most of these, as I post these there as soon as they are published. Here, I’ll just put them out in one batch. Sometimes I might also point out to some other news as well, but the new research will be the focus here. Here’s the archive for the news of previous weeks. By the way, if this sort of thing interests you, be sure to check out A Few Things Illconsidered, they have a weekly posting containing lots of links to new research and other climate related news. Note to Finnish readers: research of the last week is now available also in Finnish. Regional Patterns of Tropical Indo-Pacific Climate Change: Evidence of the Walker Circulation Weakening – Tokinaga et al. (2011) “Regional patterns of tropical Indo-Pacific climate change are investigated over the last six decades based on a synthesis of in situ observations and ocean model simulations, with a focus on physical consistency among sea surface temperature (SST), cloud, sea level pressure (SLP), surface wind, and subsurface ocean temperature. A newly-developed bias-corrected surface wind dataset displays westerly trends over the western tropical Pacific and easterly trends over the tropical Indian Ocean, indicative of a slow down of the Walker circulation. This pattern of wind change is consistent with that of observed SLP change showing positive trends over the Maritime Continent and negative trends over the central equatorial Pacific. Suppressed moisture convergence over the Maritime Continent is largely due to surface wind changes, contributing to observed decreases in marine cloudiness and land precipitation there. Furthermore, observed ocean mixed-layer temperatures indicate a reduction in zonal contrast in the tropical Indo-Pacific characterized by larger warming in the tropical eastern Pacific and western Indian Ocean than in the tropical western Pacific and eastern Indian Ocean. Similar changes are successfully simulated by an ocean general circulation model forced with the bias-corrected wind stress. Whereas results from major SST reconstructions show no significant change in zonal gradient in the tropical Indo-Pacific, both bucket-sampled SSTs and nighttime marine-air temperatures (NMAT) show a weakening of the zonal gradient consistent with the subsurface temperature changes. All these findings from independent observations provide robust evidence for ocean-atmosphere coupling associated with the reduction in the Walker circulation over the last six decades.” Hiroki Tokinaga, Shang-Ping Xie, Axel Timmermann, Shayne McGregor, Tomomichi Ogata, Hisayuki Kubota and Yuko M. Okumura, Journal of Climate 2011, doi: 10.1175/JCLI-D-11-00263.1. 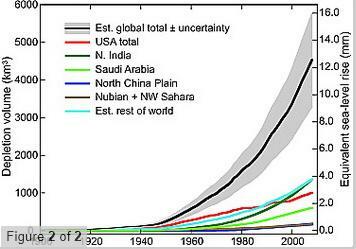 Contribution of global groundwater depletion since 1900 to sea-level rise – Konikow (2011) “Removal of water from terrestrial subsurface storage is a natural consequence of groundwater withdrawals, but global depletion is not well characterized. Cumulative groundwater depletion represents a transfer of mass from land to the oceans that contributes to sea-level rise. Depletion is directly calculated using calibrated groundwater models, analytical approaches, or volumetric budget analyses for multiple aquifer systems. Estimated global groundwater depletion during 1900–2008 totals ∼4,500 km3, equivalent to a sea-level rise of 12.6 mm (>6% of the total). Furthermore, the rate of groundwater depletion has increased markedly since about 1950, with maximum rates occurring during the most recent period (2000–2008), when it averaged ∼145 km3/yr (equivalent to 0.40 mm/yr of sea-level rise, or 13% of the reported rate of 3.1 mm/yr during this recent period).” Konikow, L. F. (2011), Geophys. Res. Lett., 38, L17401, doi:10.1029/2011GL048604. The future of dry and wet spells in Europe: A comprehensive study based on the ENSEMBLES regional climate models – Heinrich & Gobiet (2011) “Under the aspect of future climate change, it is important for decision makers to know how drought conditions might change on the regional scale in order to map out adequate adaptation and mitigation strategies. Recent RCM simulations provided by the ENSEMBLES project are used to analyse changes in dry and wet conditions in Europe by the mid of the 21st century under the A1B emission scenario. Eight RCMs are selected to capture the uncertainties of the projected changes. An empirical statistical error correction approach is applied to modelled daily mean air temperature and precipitation amount to account for RCM errors, and commonly used drought indices—the Standardized Precipitation Index (SPI), the self calibrated Palmer Z-Index (scZI) and Palmer Drought Severity Index (scPDSI)—are calculated. Changes in the mean, in interannual variability, and in frequency, length, distance, magnitude, and area of dry and wet events are investigated. The statistical significance of the projected multi-model mean changes and the according uncertainties are analysed for nine European subregions. Furthermore, distributional changes of the dry and wet spell characteristics are assessed. Changes in the mean, and in dry and wet event characteristics show the most pronounced changes towards drier and wetter conditions in the southern- and northernmost European subregions, respectively. Here, the changes are highly significant and confident, while the projected changes are more dissonant for the other subregions. Severe changes in the extremes of event length, distance, magnitude, and area particularly arise in the southern- and northernmost European subregions. The projected changes in interannual variability are less significant and confident. However, significantly increasing interannual variability is projected in regions with pronounced changes in the mean towards wetter as well as towards drier conditions.” Georg Heinrich, Andreas Gobiet, International Journal of Climatology, DOI: 10.1002/joc.2421. Sea surface and high-latitude temperature sensitivity to radiative forcing of climate over several glacial cycles – Rohling et al. 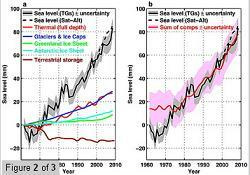 (2011) “We compile global sea-surface temperature (SST) records that span around one glacial cycle or more. We compare these with changes in the Earth’s radiative balance over the last 520,000 years, as determined from greenhouse gas concentrations, albedo changes related to ice-sheet area and atmospheric dust fluctuations, and insolation changes. A first scenario uses global mean values for the radiative changes, and a second scenario uses zonal means for 10° latitude bands for a more regionally specific perspective. On the orbital timescales studied here, we find a smooth increase of SST response from the equator to high latitudes when comparison is made to global mean radiative forcing, but a sharply ‘stepped’ increase at 20–30° latitude when comparing with the more regionally specific forcings. The mean global SST sensitivities to radiative change are within similar limits for both scenarios, around 0.8 ±0.4 °C/Wm−2. Combined with previous estimates of 1.3 to 1.5 times stronger temperature sensitivity over land, this yields an estimate for global climate sensitivity of 0.85 (−0.4/+0.5) °C/Wm−2, close to previous estimates. Had we considered aerosol (dust) feedback as a fast feedback, then the estimated central value for SST sensitivity would change to ~0.95 °C/Wm−2 and that for global climate sensitivity to ~1.05 °C/Wm−2. Our zonal-mean scenario allows an assessment of (long-term) ‘normalised amplification’ for Greenland and Antarctic temperature sensitivities, which is the ratio of temperature sensitivity for those sites relative to the global mean sensitivity, normalised per Wm−2 of radiative change. This ratio is found to be 0.9 (−0.2/+0.6) and 1.4 (−0.4/+1.1) for Greenland and Antarctica, respectively. Given its value close to 1 for Greenland, but that we cannot exclude larger Arctic amplification on shorter timescales due to fast sea-ice albedo processes, we suggest that current high Arctic sensitivity is mainly due to sea-ice albedo feedback processes and may decrease considerably if and when the Arctic sea-ice cover has been eliminated. The normalised amplification value of 1.4 for Antarctica supports previous reconstructions of polar amplification in that region. We propose that this amplified response resulted from ~3-fold glacial-interglacial changes in the area of sea-ice cover around Antarctica.” Rohling, E. J., Medina-Elizalde, M., Shepherd, J. G., Siddall, M., Stanford, J. D., Journal of Climate 2011, doi: 10.1175/2011JCLI4078.1. Coal to gas: the influence of methane leakage – Wigley (2011) “Carbon dioxide (CO2) emissions from fossil fuel combustion may be reduced by using natural gas rather than coal to produce energy. Gas produces approximately half the amount of CO2 per unit of primary energy compared with coal. Here we consider a scenario where a fraction of coal usage is replaced by natural gas (i.e., methane, CH4) over a given time period, and where a percentage of the gas production is assumed to leak into the atmosphere. The additional CH4 from leakage adds to the radiative forcing of the climate system, offsetting the reduction in CO2 forcing that accompanies the transition from coal to gas. We also consider the effects of: methane leakage from coal mining; changes in radiative forcing due to changes in the emissions of sulfur dioxide and carbonaceous aerosols; and differences in the efficiency of electricity production between coal- and gas-fired power generation. On balance, these factors more than offset the reduction in warming due to reduced CO2 emissions. When gas replaces coal there is additional warming out to 2,050 with an assumed leakage rate of 0%, and out to 2,140 if the leakage rate is as high as 10%. The overall effects on global-mean temperature over the 21st century, however, are small.” Tom M. L. Wigley, Climatic Change, DOI: 10.1007/s10584-011-0217-3. Harvesting in boreal forests and the biofuel carbon debt – Holtsmark (2011) “Owing to the extensive critique of food-crop-based biofuels, attention has turned toward second-generation wood-based biofuels. A question is therefore whether timber taken from the vast boreal forests on an increasing scale should serve as a source of wood-based biofuels and whether this will be effective climate policy. In a typical boreal forest, it takes 70–120 years before a stand of trees is mature. When this time lag and the dynamics of boreal forests more generally are taken into account, it follows that a high level of harvest means that the carbon stock in the forest stabilizes at a lower level. Therefore, wood harvesting is not a carbon-neutral activity. Through model simulations, it is estimated that an increased harvest of a boreal forest will create a biofuel carbon debt that takes 190–340 years to repay. The length of the payback time is sensitive to the type of fossil fuels that wood energy replaces.” Bjart Holtsmark, Climatic Change, DOI: 10.1007/s10584-011-0222-6.